In ancient China, a pudgy young panda named Po (voiced by Jack Black) dreams of "legends full of legendary warriors whose exploits are the stuff of legends." In these Technicolor daydreams, even the legendary Furious Five are no match for a panda's bodacity. In real life, or as real as a cartoon fantasy gets, Po is a clumsy doofus, for whom rising from a supine position can take all morning. He has the doughy shape, the domineering amiability and, ultimately, the demented perseverance of an ursine Michael Moore. And Po's job is not to defeat mythical miscreants but to be a waiter in the village noodle shop run by his father (James Hong)  who happens to be a goose, but never mind for now. When Po hears that the thousand-year-old turtle Oogway (Randall Duk Kim) is to anoint a Dragon Warrior that day, he schleps his dumpling wagon to the ceremony. In a crowded courtyard, the greatest fighters of their time, the Furious Five  the Crane (David Cross), Viper (Lucy Liu), Mantis (Seth Rogen), Tigress (Angelina Jolie) and Monkey (Jackie Chan)  are showily displaying the fabulous skills they have honed under the stern eye of their teacher Shifu (Dustin Hoffman). Then, through plot contortions even more acrobatic than anything the Furious Five have demonstrated, Po is declared the new kung fu hero. Shifu is aghast: this clown can't be taught anything. Yet Oggway believes that the accident that dropped Po out of the sky was no accident at all. The roly-poly panda is the one chosen to battle the evil master Tin Lung (Ian McShane), who'll be breaking out of prison any moment now. KFP's clever screenplay, by ex-King of the Hill writers Jonathan Aibel and Glenn Berger, is a tribute to the effect the '70s martial arts films had, especially on the pre-teen set, when they flooded Saturday-morning U.S. TV in the wake of Bruce Lee's success with Enter the Dragon. A boy who watched those movies would be nearing middle age now, but he'd recognize KFP's plot  of a laggard who undergoes rigorous training to become a great fighter  from many films, including the one that made Jackie Chan a star, the 1978 Drunken Master. A kid would also remember that, for all the explosions of melodrama and comedy in these dynamic, dime-a-dozen epics, they were essentially training films in the Shaolin regimen of self-defense. Each discipline was named for an animal, whose names often made it into the movies' titles. One of teenage Jackie's first lead roles was in Little Tiger of Canton, aka Snake Fist Fighter. In 1978, his breakthrough year, he made Snake and Crane Arts of Shaolin and Snake in Eagle's Shadow, and topped them off with Drunken Master, aka Drunken Monkey in the Tiger's Eye, aka Eagle Claw, Snake Fist, Cat's Paw, Part 2. (Hong Kong movies often had a different title for every East Asian country it played in.) As for the Furious Five, they are direct descendants of director Chang Cheh's Five Venoms movies of the same period, where the heroes were nicknamed Lizard, Centipede, Snake, Scorpion and Toad. Directors John Stevenson and Mark Osborne may have an unhealthy fondness for humiliating physical humor  there are more sight gags of fat creatures hurting themselves than in an entire run of Super Bowl commercials. The movie finds its footing once Po stops tripping over things and devotes himself to the exhausting curriculum devised by his master. 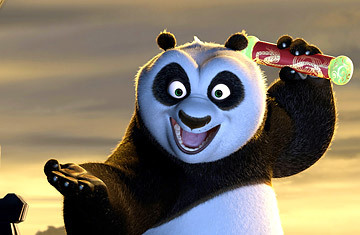 Shifu's exact species is a matter of some dispute among early reviewers of the film ( Entertainment Weekly describes him as a raccoon, The Seattle Times as a mouse and the McClatchy newspapers as a "tiny red panda"). But no one can debate the power of Hoffman's voice work, or the emotional nuance the creature communicates with the merest twitch of his three-strand beard. The movie will also remind more recent Hong Kong fans of Stephen Chow's Kung Fu Hustle, the story of an oaf who becomes a hero against by battling a long-imprisoned supervillain. KFP shifts into high gear when its big baddie, Tai Lung, escapes from his prison dungeon, breaking chains, bones and the law of gravity with equal finesse. Many of the fights  Tai Lung vs. the Five Furies, or vs. Shifu or, finally, against a certain panda  are so smartly thought out and spectacularly executed that they might have been designed by an ace stunt coordinator like Yuen Wo-ping. One scene, which has Po and Shifu dueling with chopsticks, stilts and tree branches to grab the last available dumpling, is an instant classic. I'd have liked Po to make greater use of his noodle-shop skills in the climactic fight. And although Black's loud, friendly, shambling screen personality makes a smooth transference to panda form, I wish Po were more persuasively drawn; visually, he's the least interesting character. But the menagerie that surrounds him is a gorgeous one. And the movie's message  that strength and discipline can't be taught, but must be discovered within  has a wise heart that matches the movie's art. That's the secret ingredient for an animated feature. That and some sublime kung-furious panda-monium.